Chuck designs the piece then builds the specific jigs necessary for each project. Some items have as many as seven different jigs. 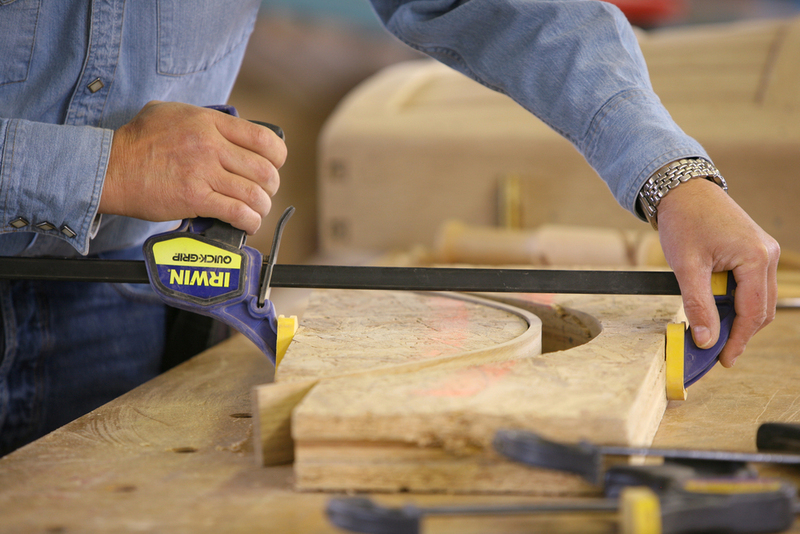 Each jig has a specific compound curve that must be perfectly engineered. Hand-selected premium pieces of wood are cut to size and then placed in a steam cabinet. Steaming the wood softens the fibers making it pliable for a short time. When the wood is taken out of the steam cabinet it must immediately be secured in the jigs before it starts to cool and is no longer bendable. After the wood is dry, it is removed from the jigs. Assembling the pieces then begins, with each piece worked with until it fits flawlessly. After construction, we begin the process of aging and distressing the wood to give it the appearance of many years of use. This includes sanding, staining and hand-waxing the wood chest to give it a beautiful antique finish. Attractive authentic reproduction hardware is attached with clinched trunk nails and screws. Interiors of the trunks can be left wood or lined with fabric, leather or cedar if so desired. The chest can be personalized with names, pictures or personal memorabilia. When complete, each item is personally signed by the artists, Chuck and Sherry Zeller. It gives us great pleasure to create a piece of furniture which will be a valued family possession for many generations to come. We also make a military chest, treasure chest, quilt chest and bridal chest. Other unique items are wooden hat boxes, coffee tables, end tables, TV cabinets, wine carriers, wall crosses and boot jacks. Custom orders are welcome! Give us your idea and we can build it especially for you. The process of handcrafting each trunk takes up to 2 to 3 months to complete.